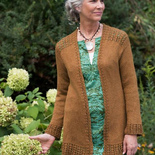 Bust—33 (37, 41, 45, 49, 53, 57, 61)"
This relaxed knitted cardigan demonstrates how lovely a little bit of lace can be in Berroco Quinoa. 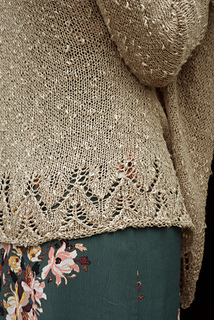 The body is knit in one piece to the armholes, then sleeves are knit and joined before working the raglan yoke. Note: This garment was designed with approximately 1–2” of ease. Please take this into consideration when selecting your size.